I was given a Pancakebot but it came without the SD card. Do i need to get a special Pancakebot SD card or can i use any SD card that has the specific calibrated images on it? How do I get an SD card so I can use my Pancakebot? Miguel Valenzuela I recommed SD cards under 32 gigs. You don't need very much space, a 1 gig card would do if they still made them. Just mske sure it is formated to FAT32. Any chance of an msi installer for Pancakebot Win 10 64bit please, GPO/SCCM mass deployment required. Miguel Valenzuela Hi Tyrone. This forum is not managed by the manufacturer so if you need specific hardware support, you can contact support@storebound.com. What are the units of measurement for the Bot Speed and Line End Pre-Shutoff Distance? G. Ellis I'm guessing millimetres per second for the speed. But can somebody please confirm? and units for line end pre-shutoff distance say dv/px.... what does this stand for? something per pixel? Jack Adee posted When I try to export a file for printing it just gives me that blue loading bar forever and never loads. I have gotten a few designs past it but I’m looking for a solution. Tristan Same thing. Even tried letting the export run on the attached PBP overnight, but the blue loading bar never moved. Tried with both 64 and 32 bit version 1.4 of the software. i7 proc with 16GB ram... seems like a software bug. Do you have the latest software? Also, do you have many fills on it? If there are many fills, it can take a while for the algorithm to process. Send me some specs on your software version, (should be 1.4), your computer (Mac, PC) and even include the PBP File in this attachment. Miguel Valenzuela posted It seems that Storebound has not updated the site with the latest software as of today. 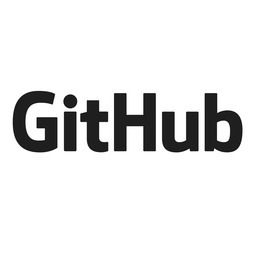 Visit Github.com for the latest release. While the software installed and runs successfully on my Mac. When I select the gcode file on the PancakeBot and hit play, it doesn't do anything. Please advise. Lori Nicolanti Thank you! That version installed on my laptop. I am still visiting family so I can't try it out yet, but it installed and is running without any issues. 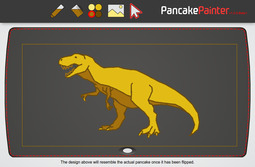 The PancakeBotÂ® site is a network for people to connect with other PancakeBotÂ® users through asking/answering questions and sharing their designs. Zach posted When i save a picture from the painter software. It saves as a php file. If I save this type of file to my memory card. Will the pancakebot read it? If not, how do i change it to a gcode? 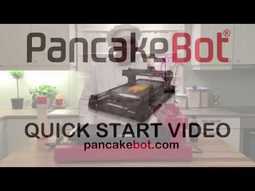 Miguel Valenzuela PBP files are PancakeBot Painter files holds JSON Information for Pancake Painter to Read. 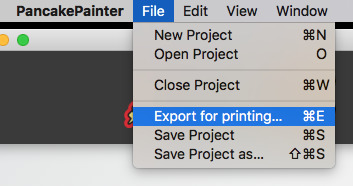 To get the GCODE File, you go to File, Export For Printing, and that takes you to a dialogue box that has settings for the GCODE File. On those settings you can control how the batter is dispensed by designating timing and line thickness. BJG posted Hi. Am using PancakePainter v1.04 on a Windows 7 PC with PancakeBot 2.0. Have imported image I want to print and it looks fine with a dark outline, etc. But when I export for printing the dark outline (an other areas) becomes light while the light areas become dark. Therefore when pancake prints there is not an outline that contains the rest of the batter as prints; outline prints last so windup with blobby edges. I have tried re-importing (I tried both leaving default edge setting and toggling to dark outline) and exporting (tried resetting to default export settings), but still get same export results no matter changes made. Suggestions? Miguel Valenzuela Is this on the render for the software? That seems to be bug. I will add this to the report. thijmen posted hi, if i try to instal the software i get every time a setup error, some one has expirience this to ? and does somebody know how to fix this ? Joe posted I have downloaded the software to my PC. And saved files to print via .pbp but nothing. My Bot is not reading anything on the SD card. What am I missing? You will want to open the .pbp file in the Pancake Painter software and then export the .GCODE file. The reason for the difference is the Pancake Painter Software exports files according to different settings (timing etc. ).